'Just when it looks our film-making is moving away from idolising toxic archetypes for the sake of romantic fulfillment, Aleya Sen's Dil Juunglee comes along and squashes it in entirety,' says Sukanya Verma. Watching Dil Juunglee is like going through a checklist of Bollywood's oldest and lamest clichés recycled for the nth time to dispense yet another doggone boy-meets-girl baloney. In ad filmmaker Aleya Sen's garbled feature film debut, we revisit all the agonising scenarios at their most lacklustre, beginning with Sumeet (Saqib Saleem), a regular Delhi lout juggling jobs as gym trainer and body double of dubious ads while seeking his fortune in showbiz. In comes mousy Koroli aka Koro (Taapsee Pannu), the London-born, half-British daughter of a snobby industrialist incurring her daddy's wrath for dropping out of business school to play English teacher to dummies. We know this type all too well. Someone who sports glasses, frowzy hair, a dowdy wardrobe and is just a couple of tequila shots away from kicking her heels. The hangover lasts pretty much until its last reel. Soon she's not only showing Sumeet how to pronounce 'miraculous' but also demonstrating it by promptly falling for him. 'Pehli date mein tujhe ma ke kangan chahiye. Doorsi date main Gandhari ki tarah sau bache,' remarks her disapproving best friend. Yet such is the extent of Koro's flimsy inferiority complex, the woman cannot tell between callous and charming and insists on Sumeet as Mr Right. Her desperation is all the more confounding given the hot potato treatment she receives after his over-the-top, old-fashioned mummy cries, 'Manglik'. In the olden days, the conflict would arise from the glaring difference between the boy and girl's economical backgrounds. In Dil Juunglee, astrology does the needful. Clearly, we're not making any progress. But before I can scoff any more at this ridiculous development, the bizarrely edited drivel has shifted to a jungle trek that's actually Koro and Sumeet eloping to marry in the company of their quarrelsome buddies. What happens next is anyone's good guess. The story jumps seven years ahead and still shows no signs of maturity. Unless we're expected to find it in the inevitable Koro makeover -- sparkling up the streets of London in all her sleek hair, stylish wardrobe, specs-are-history avatar. Amidst phony board meetings, awkward family reunions, contrasting new love interests and an unnecessary gay caricature popping in and out, Dil Juunglee forces a reconciliation between happily moved on exes no one's convinced about or rooting for. Just when it looks our film-making is moving away from idolising toxic archetypes for the sake of romantic fulfillment, Aleya Sen's Dil Juunglee comes along and squashes it in entirety. Surprising such disregard should come from a woman. In her diary Koro writes, 'He hasn't changed one bit' referring to Sumeet's enduring insensitivity as though it's a good thing. She's stupid. So is this amateurishly directed, unfunny, charmless rom-com. 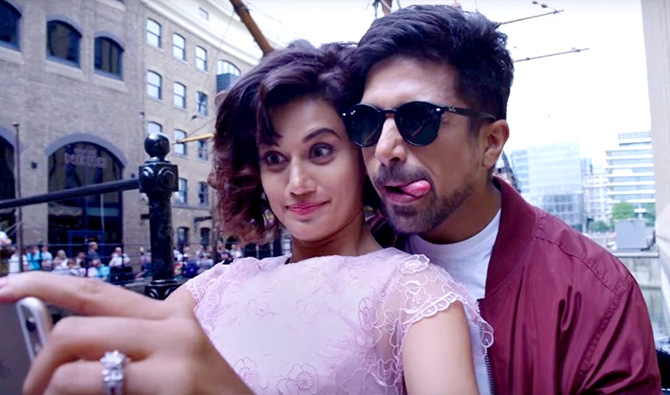 It's exasperating to watch the luminous Taapsee Pannu, with all her smarts and sensitivity, strong-armed into making googly eyes at a wishy-washy Saqib Saleem. Dil Juunglee may reward his conceit for jumping into the water, but that won't wash his sins away or make suffering fools a love story.